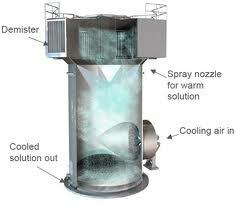 A quench tower is a gas cooling and pollution control device in which heated gases are showered with water. A quench chamber having a liquid coolant is disposed downstream of the combustion chamber. 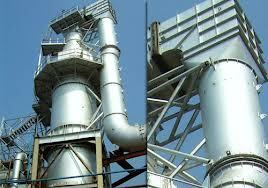 A dip tube is disposed coupling the combustion chamber to the quench chamber. The syngas is directed from the combustion chamber to the quench chamber via the dip tube to contact the liquid coolant and produce a cooled syngas. An asymmetric or symmetric faceted baffle is disposed proximate to an exit path of the quench chamber. The cooled syngas is directed through between the dip tube and the quench chamber and impacted against the faceted baffle so as to remove entrained liquid content from the cooled syngas before the cooled syngas is directed through the exit path. 1. "Quench Chamber Assembly for a Gasifier Â Â ." Quench Chamber Assembly For A Gasifier. N.p., n.d. Web. 23 Jan. 2013.